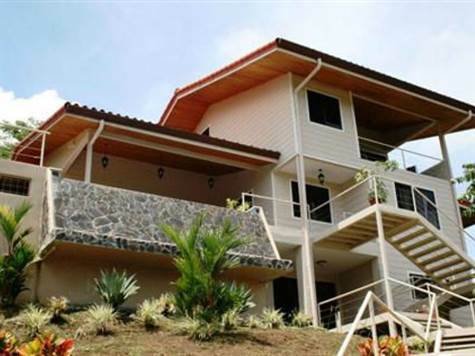 The Tradewind Villa III is located in tranquil Valle Pura Vida, a quiet residential neighborhood in central Manuel Antonio. It is perched atop a ridge-end, and thus receives good sunlight from all directions, as well as open, lofty views. There are ocean views from both levels of the house, as well as the pool. The lower level is an independent 2-bedroom apartment, measuring 1470 square feet, and has 2 bedrooms, each with 2 queen sized beds, and a shared bath. There is a large living space, and a full kitchen. The upper home consists of 3 bedrooms, and 2.5 baths. The main level has a spacious living area, two bedrooms with a shared bath, and a beautiful kitchen that opens up to the pool area. The upper level is dedicated to a large master, with a fantastic bath, walk-in closet, and balcony. This home is part of a small, three-home compound with a private drive and a guard house. Inquire for more details.